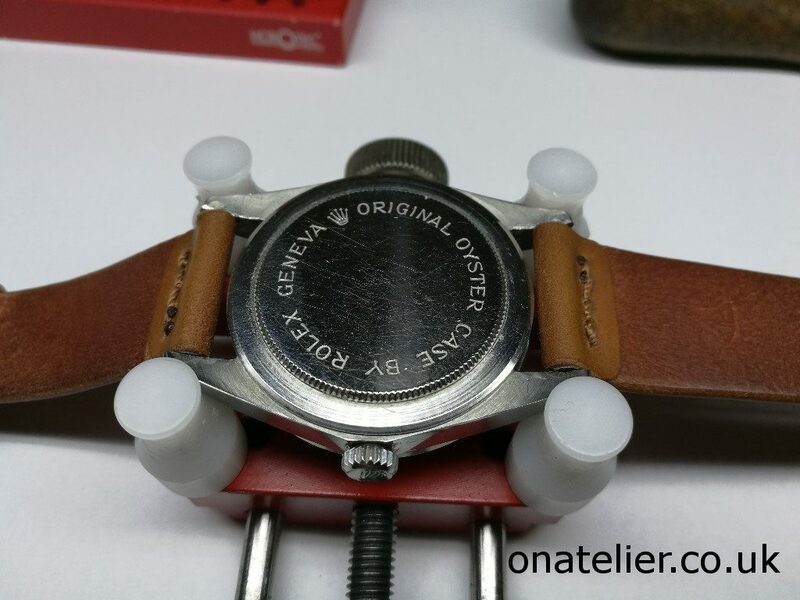 I start by opening the caseback, this is the famous Rolex Oyster case design. This reveals the movement. 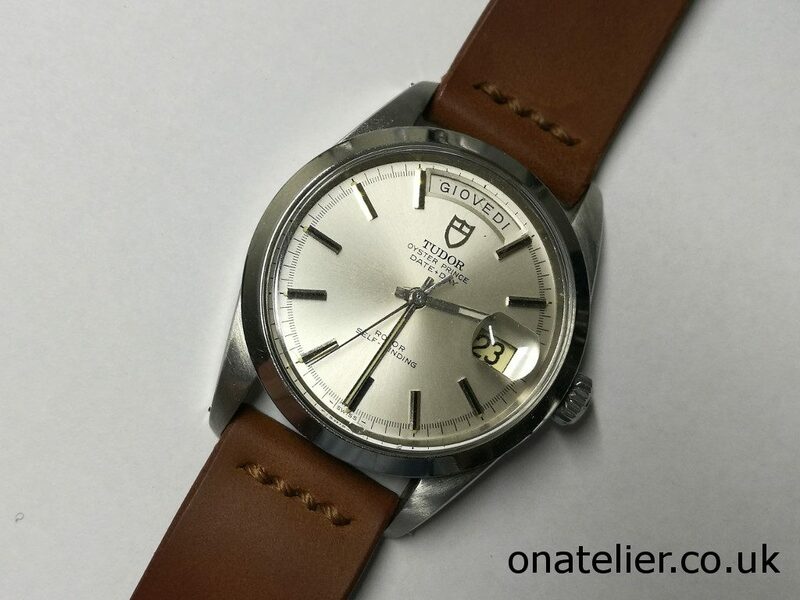 It is based on an A. Schild 1895 calibre, although the Tudor version is much better finished than the standard ebauche. 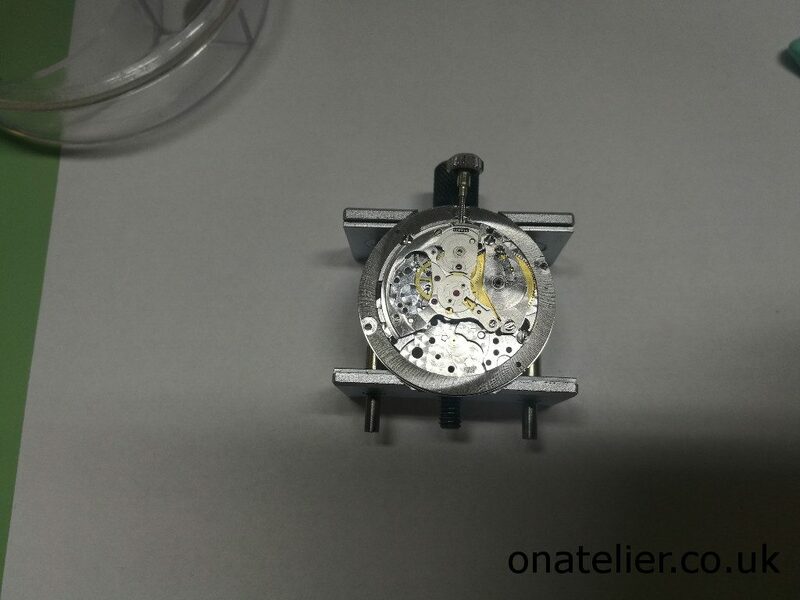 Dial and movement out of the case, ready to carefully remove the hands from the dial. Here you can see the day star. This one is in Italian which makes a nice change. 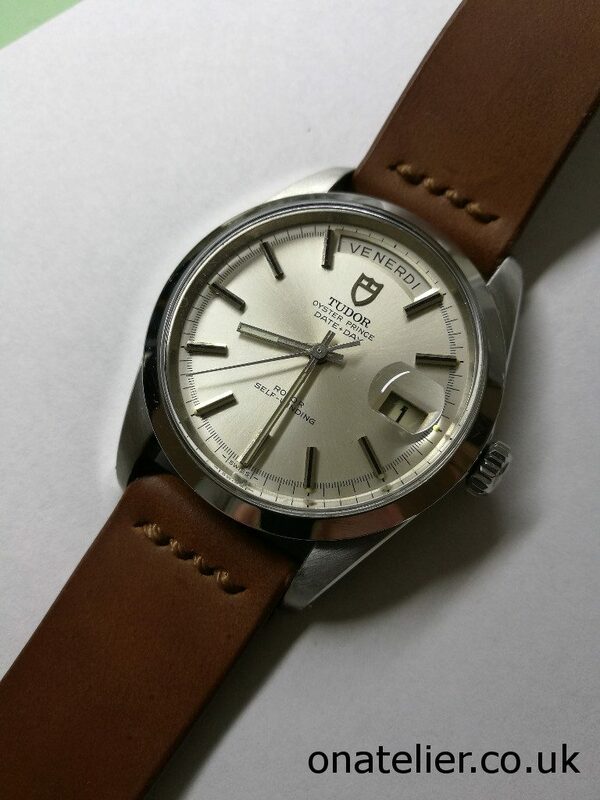 I really like the layout of the day complication on Rolex and Tudor watches, with the display at the top of the dial. 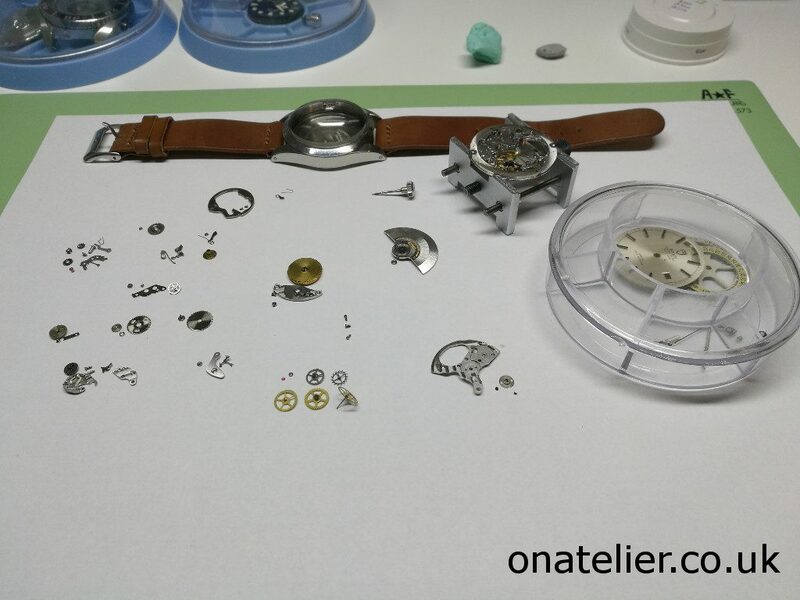 I start stripping down the dial side. I mentioned before that the seconds hand is ticking, but the hour and minutes hand are not moving. 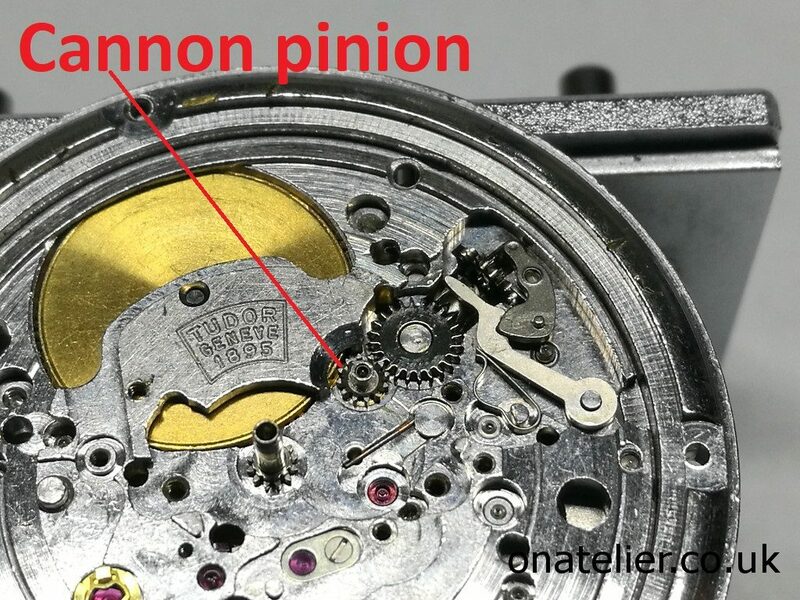 This is a typical symptom of a slipping cannon pinion. 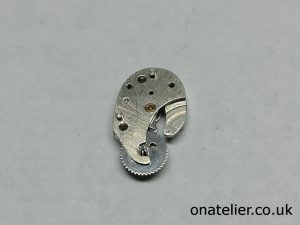 This movement has an offset cannon pinion, and the friction has been lost after years of high pressure, metal to metal contact. 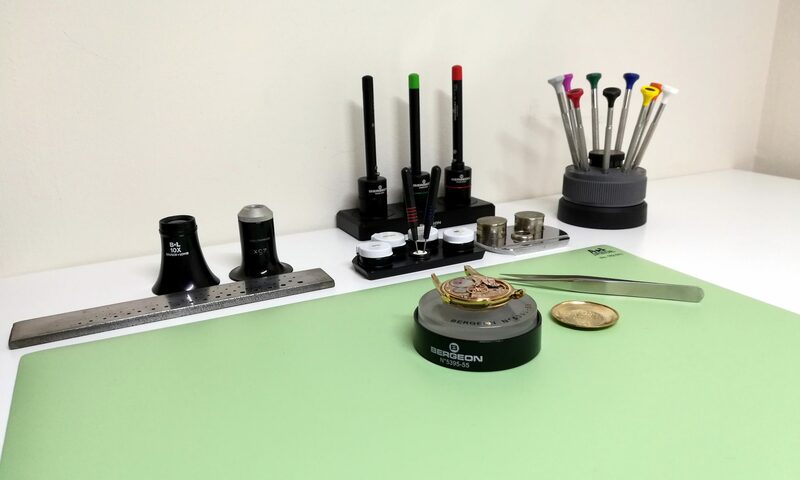 The part can be tightened, but on this occasion with parts available I opt to replace intermediate wheel and cannon pinion for a durable solution. 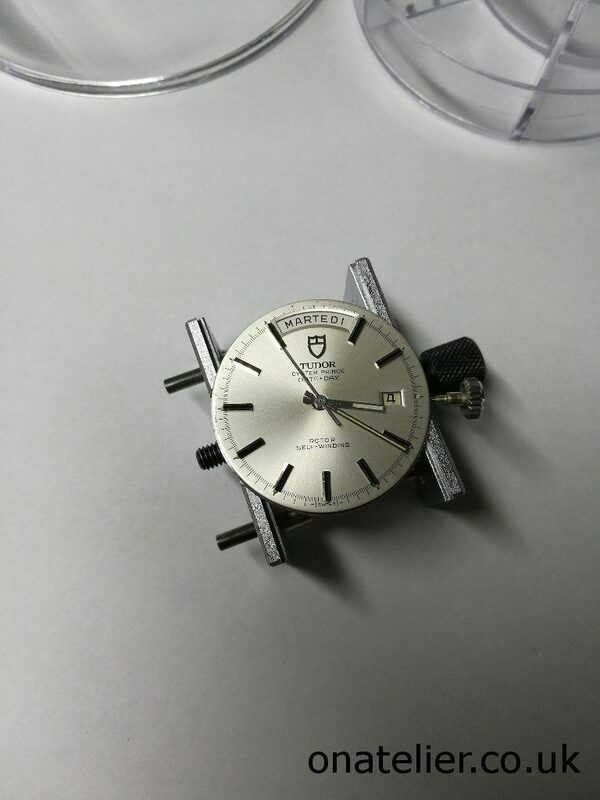 This effectively restores the friction as it would have been the day the watch came out of the factory. 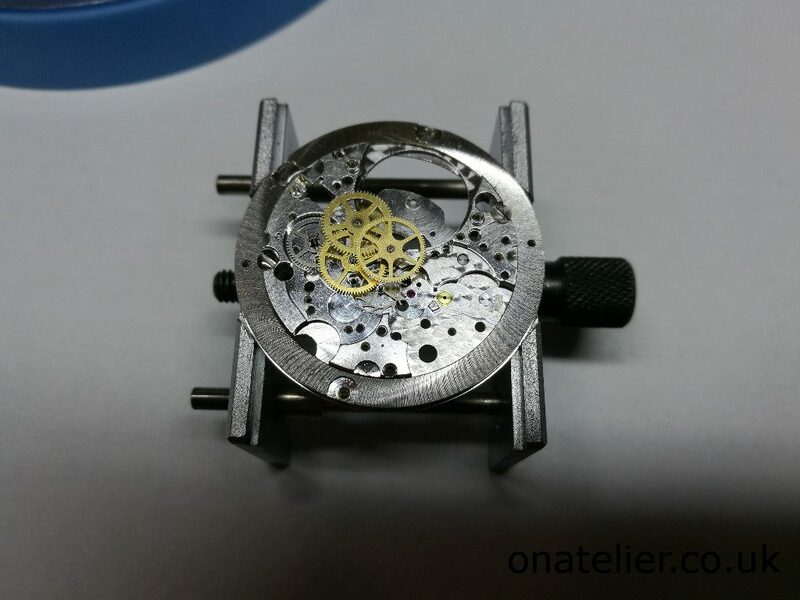 Lower side of the movement now nearly fully disassembled. 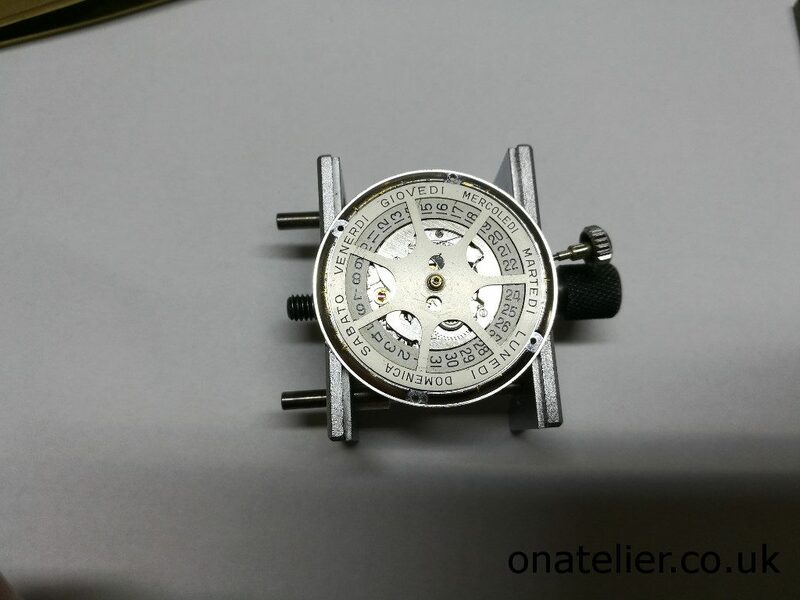 Moving on to the upper side, the oscillating weight, barrel, balance wheel and ratchet have been removed. 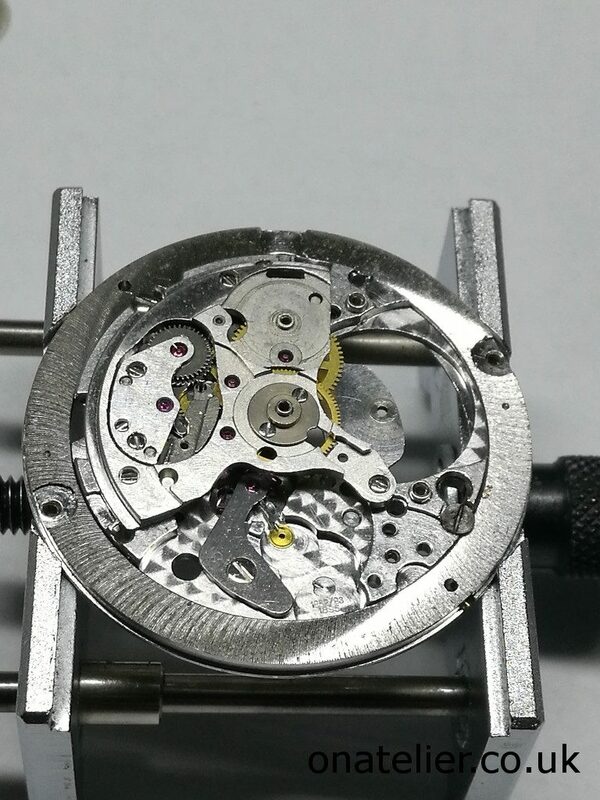 A close up on the pawl winding wheel and click system used on the automatic works on this movement. The train wheels are exposed after removing the train bridge. 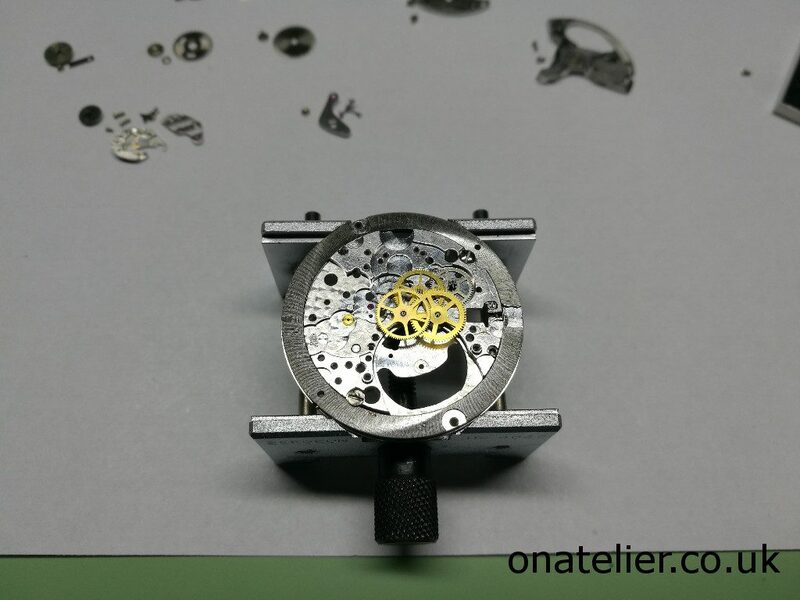 The movement is now fully stripped down, ready for cleaning and inspection of the parts. During disassembly I noticed the endshakes were unambiguously excessive. 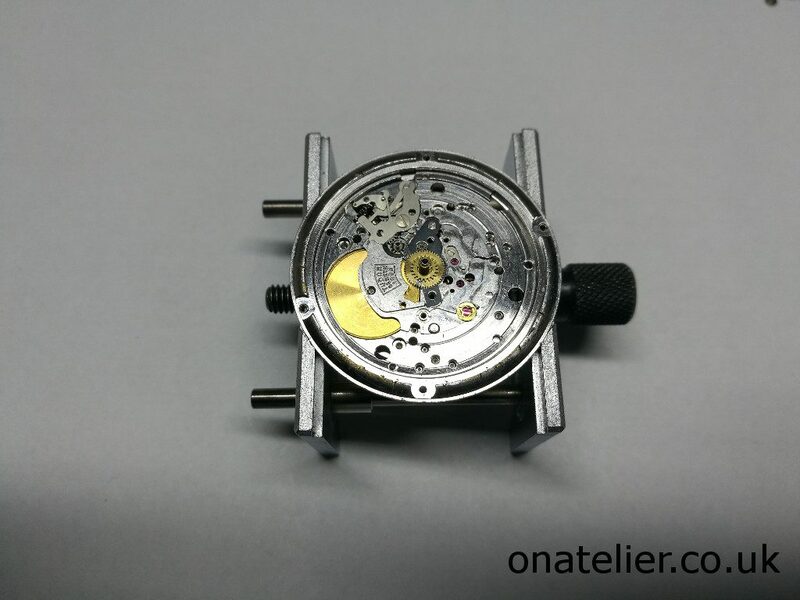 Endshake is the amount of vertical play a pivot has in a jewel-hole, it is measured in hundredths of a milliletre. 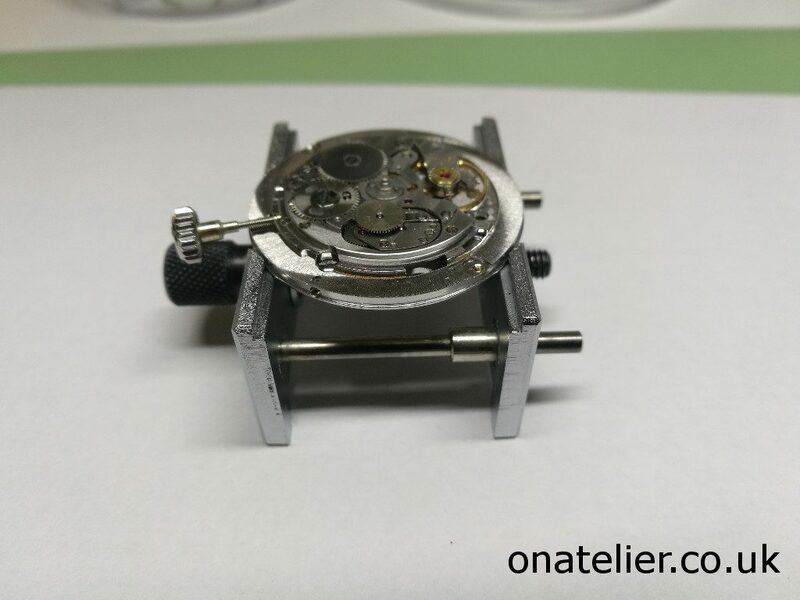 A small amount is necessary, and this amount will vary with different wheels, pivot sizes, etc… Too much of it is detrimental to good timekeeping, so the jewels positions are adjusted with a micrometric jewelling tool. Quite a time-consuming exercise, as unusually in this case every single wheel had to be adjusted. 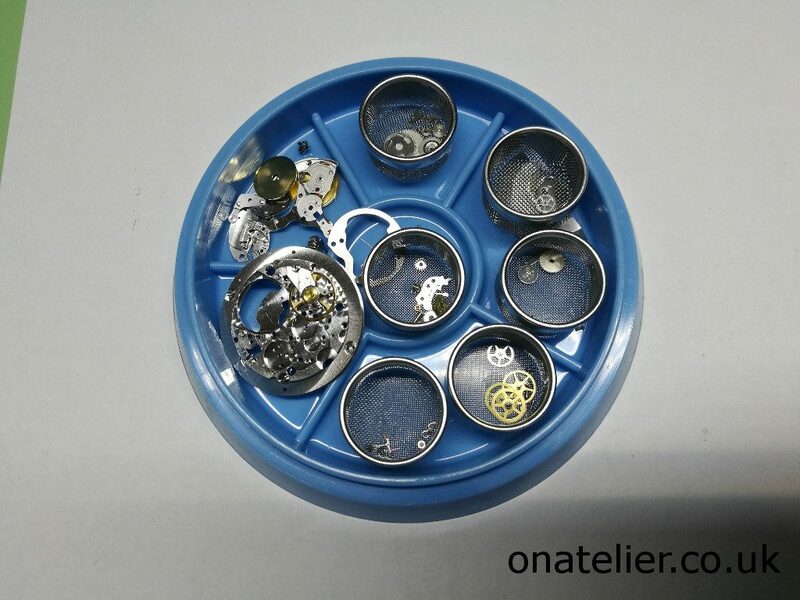 A new mainspring is fitted into the barrel. 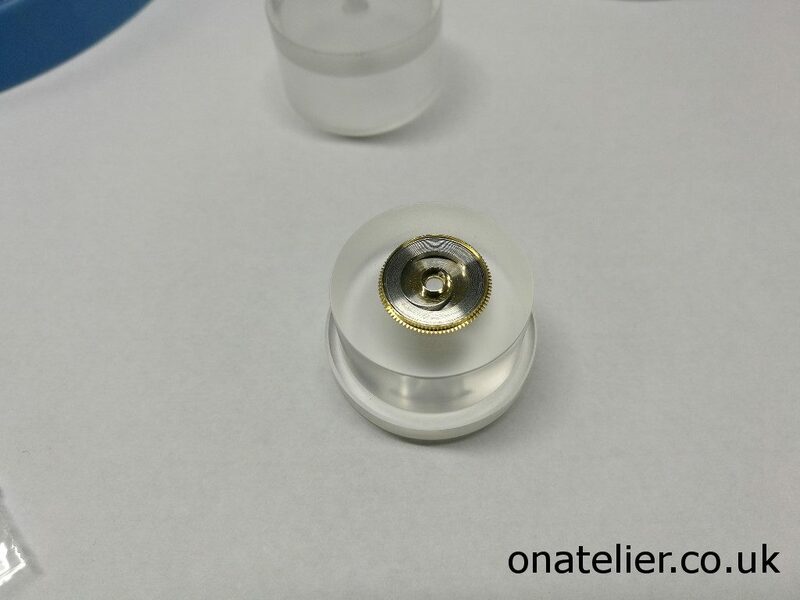 There was a little pip caused by wear on the upper balance endstone, it had run dry for too long so it was replaced. 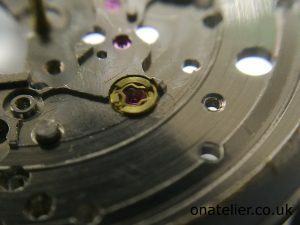 Note that the Tudor version of the AS1895 ebauche includes a KIF shock protection system, commonly found on Rolex watches (the standard AS ebauche uses Incabloc). The train wheels are reassembled now that all the endshakes are correct. The train is now re-assembled, and tested for freedom. All is good. 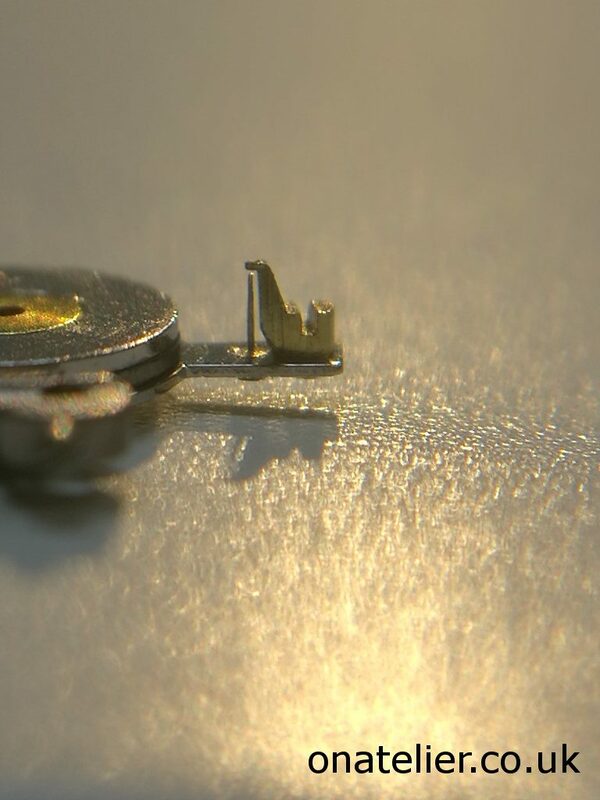 There was a bend in the regulator pin, I am guessing this was a deliberate action to correct dial up/ dial down rate differences in the past. The endshakes as they were before correction would have caused variances in different positions. An example of making a change which is not addressing the root cause of the problem. 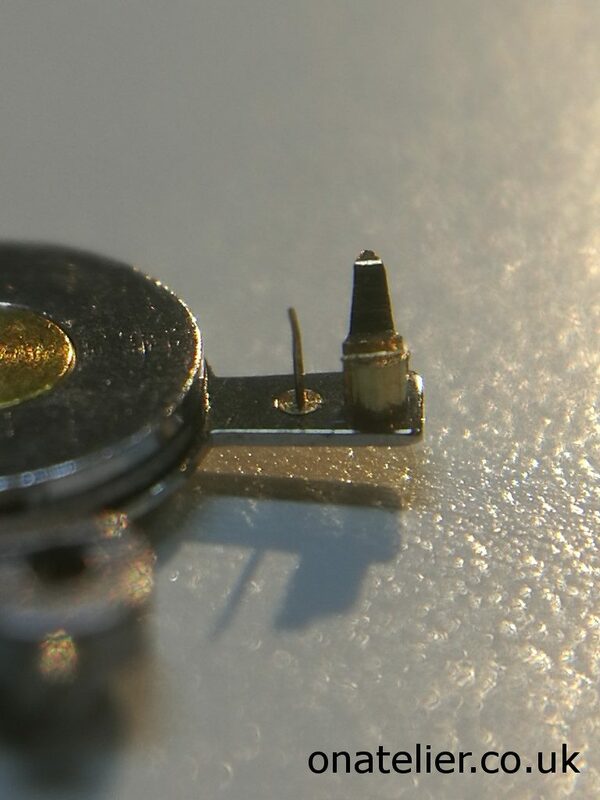 I reshaped the regulator pin, it is now nice and straight, and parallel to the regulator boot. 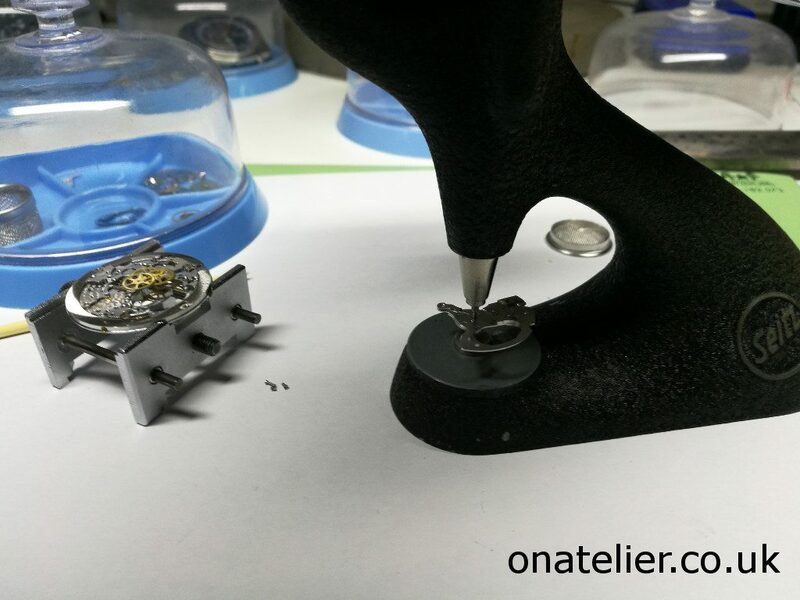 The automatic works is installed. 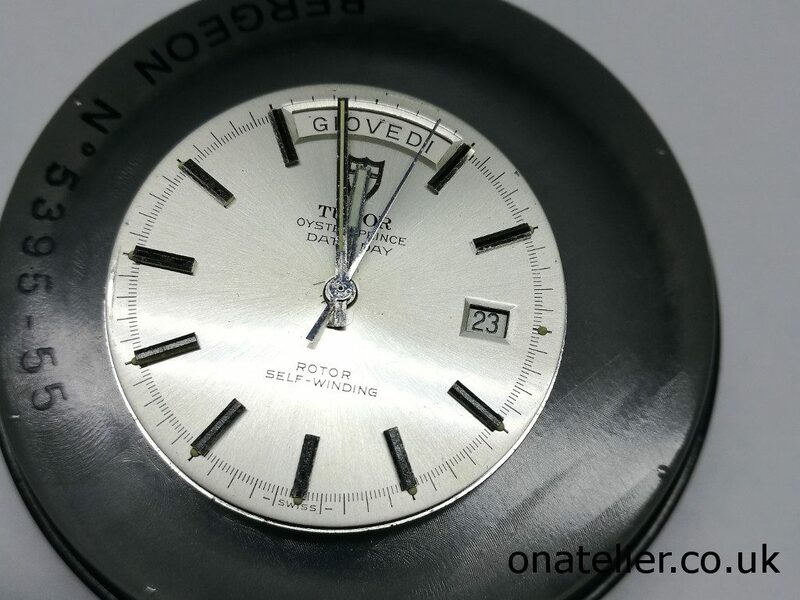 And I finish with the dial side. 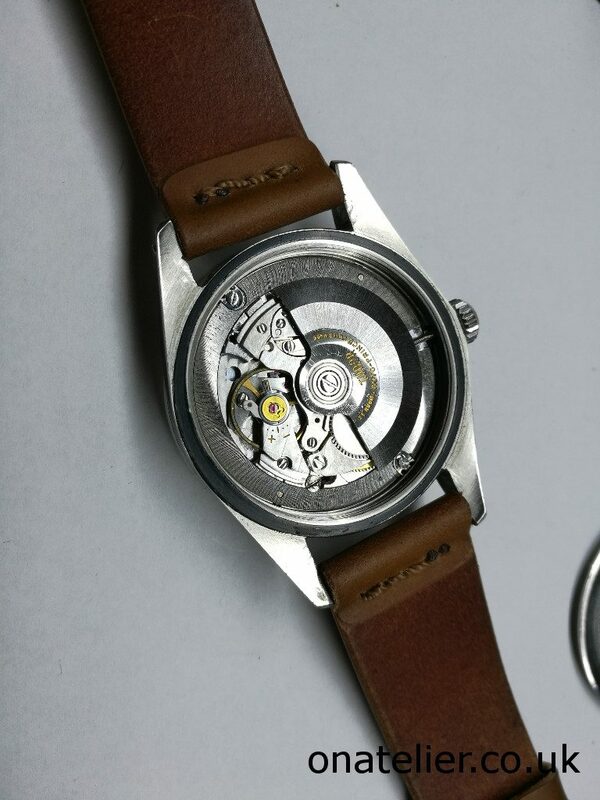 Day and date discs back on the movement. 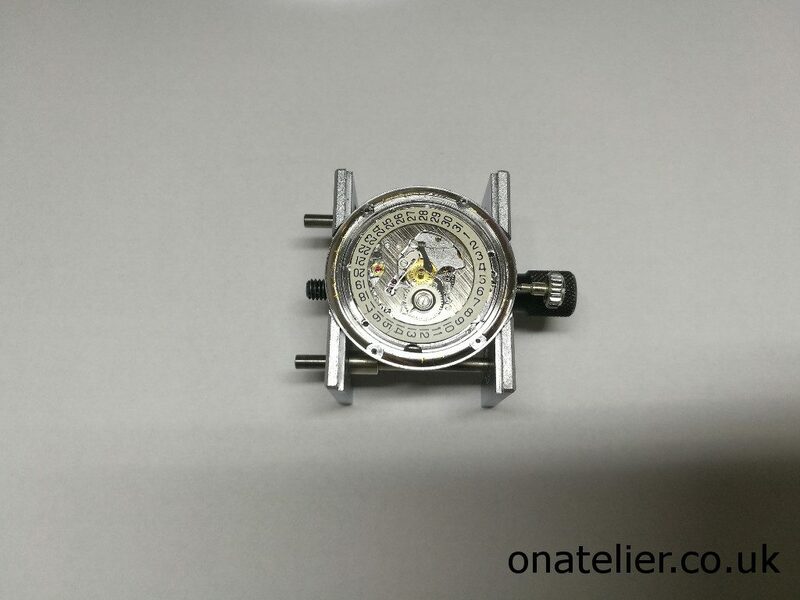 At this stage I fit the dial and hands, ready to re-case and carry out final testing. Unfortunately, during testing I notice that the date change is “lazy”, and occasionally does not change properly. 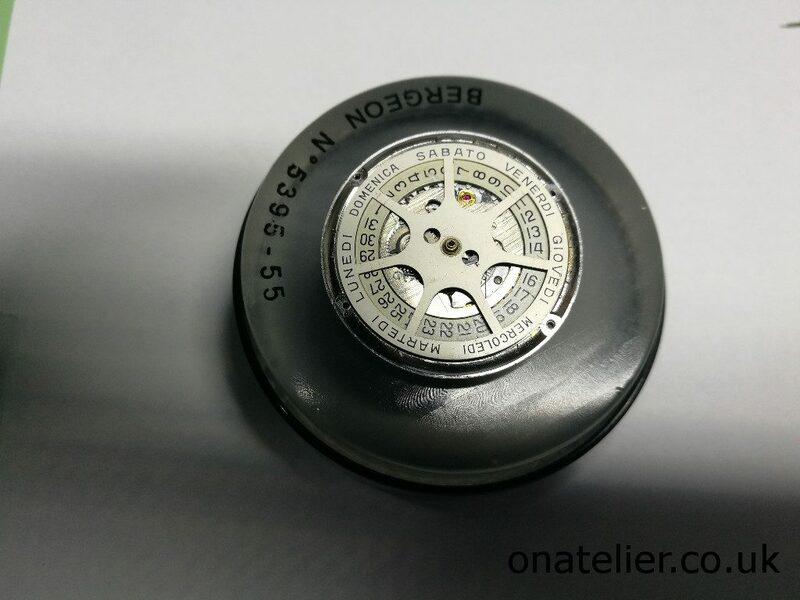 There is a quick change mechanism on this movement, so the date change should be quite snappy. 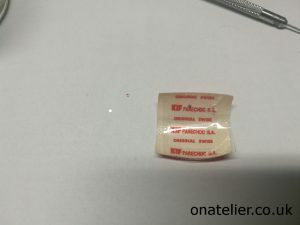 This issue can be caused by a number of things such as lack of freedom of the disc, inadequate jumper spring tension and so on. I eventually narrow it down to some burrs on the date disc teeth, which had been caused by wear over the years. 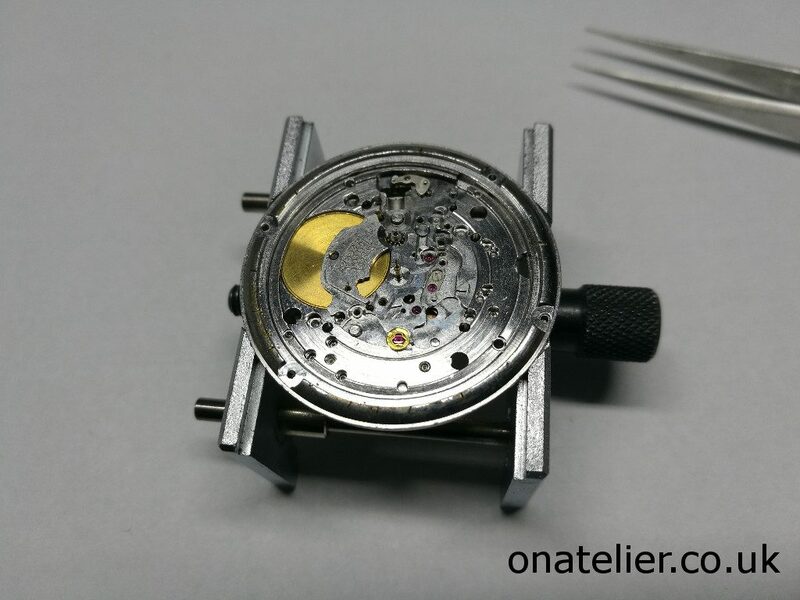 The burrs are removed, and thankfully the date change is now working again smoothly all around the calendar. And finally the service is complete. I would like to conclude by thanking Kevin for allowing me to feature his beautiful watch on the blog.